Anna Kournikova and Enrique Iglesias became parents of charming twins in December last year. Now a well-known tennis player has devoted herself entirely to raising children. The kids watched the match between the national teams of Spain and Russia with their parents. The children of Kournikova and Iglesias also joined the hobbies of adults. 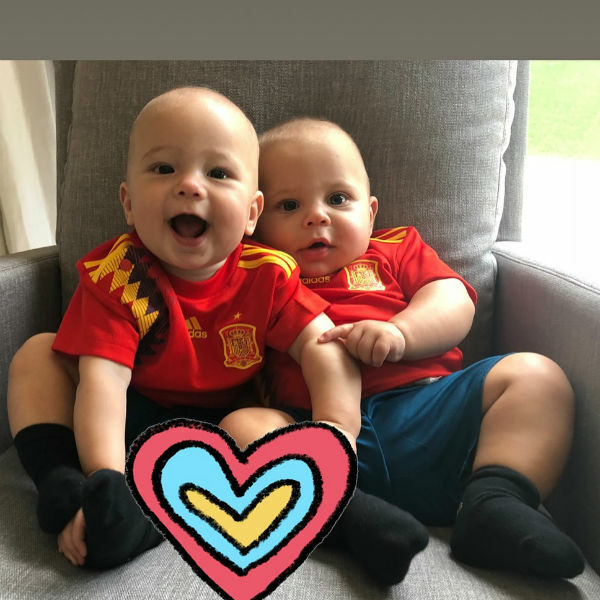 Mom dressed them first in the costumes of the colors of the Russian flag, and then in bright red T-shirts worn by Spanish fans. Apparently, the match results had no effect on family relations. Fans of the star couple every time admire the twins. “What wonderful kids! And parents "," Honey! God give you health. Anna, you're doing great! ”,“ Charming kids! ”Admired fans of Kournikova and Iglesias. Enrique's Brother, Julio Iglesias often visits his nephews. According to him, parents are trying to please the kids in everything. “They are still very small and I simply adore them. Our mother flew from Spain specifically to see the newborns. My dad was also very happy to spend time with babies, because his youngest, eighth son is already 10 years old, and the twins are quite small. They are so pretty and grow so fast! Like any children, the twins are very active and inquisitive, sometimes capricious. Now everything in the house revolves around them and submits to their daily routine. Lucy is calmer, but Nicholas is a real tomboy! Kids have a great time together and complement each other. It's funny to watch them play, laugh, explore and learn about the world around them, ”shared brother of Enrique. Kournikova and Iglesias often had conflicts. Several times the couple thought to separate. The artist was in no hurry to acquaint the chosen one with his family. Nevertheless, despite all the difficulties, they managed to become happy and have two charming babies.